It’s not only the common interests in the field of modernization and economic development that have made possible the strengthening of relations between Brazil, Russia, India, China and South Africa (since 2010) in recent years. It’s rather common foreign policy approaches, that by and large coincide, that bring these countries together. The political coordination within the BRICS framework is the major driving force of transformation from unipolar to multipolar world. In 2001 Jim O'Neal, leading analyst in "Goldman Sachs” investment bank, came out with the thesis that global economic integration is to form a new potential union including Brazil, Russia, India and China (BRIC). The assessment was based on macroeconomic data of some rapidly developing economies, especially taking into account demography, GDP growth and availability of strategic natural resources. He made a conclusion that most likely these countries will dominate in the XXI century. Indeed, the tendency to strengthen their global geopolitical status was evident in the first dozen of years of the century. Some of them, especially Brazil, India and China tried to bolster their independence in the world giving priority to regional and global level commercial and economic agreements. No doubt the rapid GDP growth of these countries-continents is what the coming new world order is based on. In just a few years this geoeconomic association developed from an analytical hypothesis into a real global actor. The BRICS agenda started to include all major issues of global economy and global economic development in general: from climate change to currency baskets or modernization, innovation based progress, production safety. Besides the BRICS members started to timely and resolutely speak out on “hot” spots” situations and emerging international conflicts. For instance, in 2011 many a time they spoke against the aggression in Libya and international isolation of Syria. They voted for the recognition of Palestine within the framework of UNESCO, they demanded the UN Security Council to be reformed. 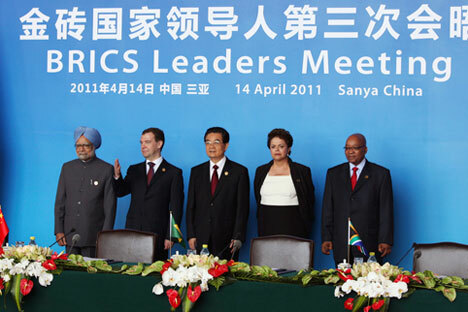 The cooperation within the BRICS group was strengthened as South Africa joined in 2010. It is becoming all the more “political” tinted and starts to influence the world power balance. No doubt the very fact of creating the “club” of these big states has expedited the transformation of multipolar world order. The BRICS phenomenon appears to corroborate the hypothesis that views Latin America and Eurasia as major driving forces in the process of the new global order taking shape. Geographically the coordination inside BRICS is actually a diagonal axis (the East of North hemisphere – Eurasia – the Western part of South hemisphere – Latin America). It could be said it’s “asymmetric” towards the trajectories: “West-East” or “North – South”. The axis “North – East – South – East” is based on three geopolitical “nuclei” – Eurasia, the peak of South Africa and Brazil – in the midterm and long term perspective it is going to squeeze out the strategic influence of the Western order headed by the United States. BRICS may come with a coordinated response (at diplomatic and economic level as yet) to the Euro-Atlantic forces expansion from the Mediterranean to Central Asia. It’s even more imperative to do taking into consideration that the pressure exerted by the USA upon Europe-Africa-Asia in recent dozen of years has acquired an obvious military tint. The militarization of the US foreign policy initiated by different administrations from Bush, Sr to Obama is the geopolitical substance of the Western system’s geopolitical methods aimed at fragmentation of separate strategic regions – the Middle East, North Africa etc. There is a certain disbalance inside BRICS at the diplomatic, economic and military level in favor of Europe. It opens at least two possible development prospects. The first is emergence of tension inside BRICS. Brazil and South Africa may return under the US “wing”. Second, a more realistic one, the disbalance may serve as a basis for boosting the process of continental integration of South America with Brazil, Argentina and Venezuela at the heart of it. The implementation of the second scenario would cement the multipolar pattern of world order. The assessment of the BRICS influence within the framework of microsystem confirms the righteousness of Paolo Borba Casella, Professor of Law. Head of International Law chair, Law Faculty of São Paulo University (Brasil). He thinks it’s an innovative, independent and original model of international cooperation that is emerging. Demonstrating respect towards cultural and historic originality of the member states, BRICS open new prospects in comparison with such international organizations as the United Nations, the World Bank, the International Monetary Fund that as is known are based on the principles of individualism and profit, worked out by the Western mentality. A lot of things bring the BRICS states together - it’s not economy only, but also common interest in the concept of international relations based on cultural substratum, the respect towards various ethno-cultural communities making up the population of the respective states. The new prospects emerging thanks to the BRICS international cooperation pattern may become an alternative to the Anglo-Saxon “global governance” model. It’s quite possible the new pattern may be a harbinger of reshape (if not the end) of the UN as well as the decline and inevitable restructurization of such international bodies as IMF, World Bank and WTO.